Even during harvest time, when food was most abundant, more than five million people — almost half the population — did not have enough to eat. 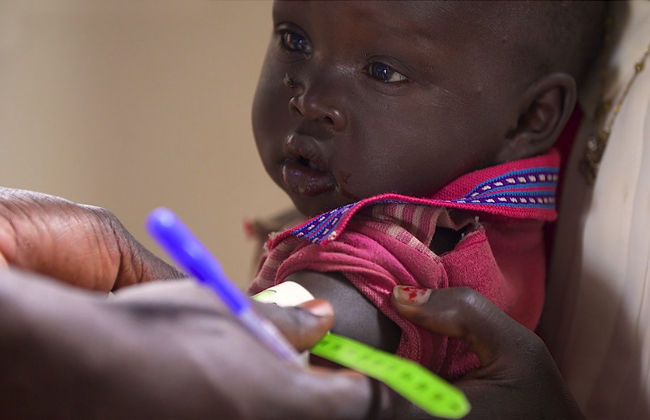 Now, as food runs out over the next few months, that number is expected to grow considerably, with millions potentially facing acute malnutrition. On top of that, peace talks have stalled and cease-fires have largely been ignored, which means the fighting has cut off some areas from emergency help. Aid workers have been targeted by government and rebel fighters alike, making food distribution increasingly difficult. But delivering that aid is another matter entirely. The rainy season hits during these lean months, too, turning many roads into rivers of impassable mud. Even within the protected camps set up around the country by the United Nations, there is not enough food to go around. Staying in the camps is dangerous enough. Attacks and sexual abuse by camp officers have been widely reported. Tafisa Nyattie, 30, who has lived in a camp since 2013, has six children. Her food rations regularly run out, so she leaves the camp daily to gather firewood, hoping to earn enough money for milk and soap to wash her children’s clothes. She walks up to three hours in each direction, braving threats from government forces before returning with a large bundle of wood on her head. On another day, she said, she was beaten and her leg was badly injured. But when she saw how hungry her children were, she decided she had no choice but to head back out again. “You just go, and you don’t know if you will come back to your children,” Mrs. Nyattie said.